I feel that I’ve spent a good chunk of my life bulk importing projects into Project Server. That usually happens as part of an initial data load, when we first populate the system with new projects – or as the output of an external project chartering process that generates a list of projects each quarter or year. 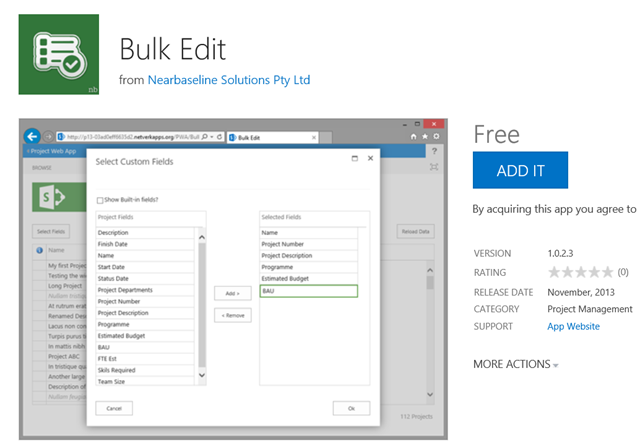 In 2010, we had the Bulk Import tool, which allowed users to convert lists of projects or initiatives into projects. The Bulk Import tool was nice, but it came with all sorts of arcane limitations which led to an incredibly frustrating user experience. In the early days of 2013, to build demos, I also found it easy to resort to VBA. I could use that to export a slew of 2010 projects, and then reimport into 2013. Luckily, as my colleague reminded me recently, there’s a Bulk Import tool built into 2013 – sort of. 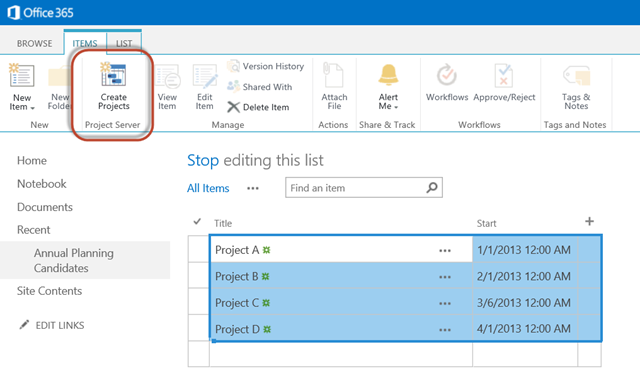 This blog post talks about how to activate that feature on a SharePoint list – thereby enabling the bulk import of projects. Unfortunately, it looks like Bulk Edit is not possible through this feature – although there’s actually an App in the App Store that supports that. Anyway, to get started on a bulk import list, go ahead and create a new site underneath the main PWA site. 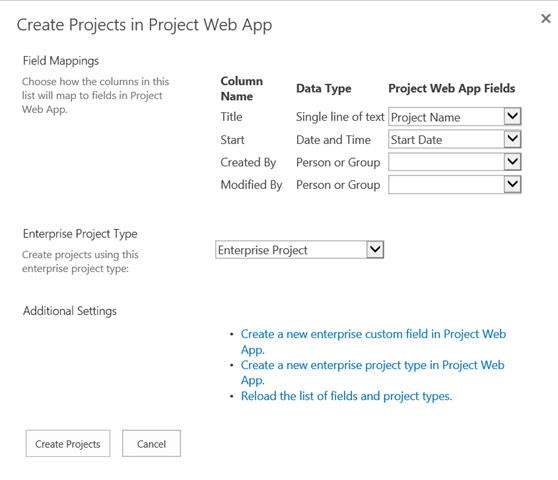 Within Site Settings, activate the feature for the Project Proposal Workflow. Create a custom list to capture your list of projects. Add fields as appropriate. Now select the projects to import, and select the Create Projects button from the Items tab. That kicks off the import wizard. And from there….we have new projects. Didn’t quite get it right? Add the Bulk Edit tool and fix the details. Great posting Andrew, very helpful – one question, am in correct in saying that you cannot bulk import against a field that is pulling data from a lookup table? Nope – you pretty much can. It’s just a matter of identifying the value that Project Server is expecting. I believe it works for Text fields, although this week, I realized there seems to be an issue with number fields tied to lookup tables. It’s very much a “your mileage may vary” sort of thing. Hi, Andrew. I am VERY new to Project Server. Right now, we have a simple SharePoint list that we use as our Portfolio Management tool (it’s a list of all of our projects, with start/stop date, PM Name, etc.). We are migrating over to Project Server and I’m thinking there must be a simple way to copy/paste or export/import the 100+ projects (items) in our existing list into the Project Server “Project Details” PDP. Right now, I am being told to enter each project one, by one, by one into the PDP via what looks like a simple list “Content Type” form. If we can do that, can we not copy/paste the data into some sort of “datasheet” view or other method within Server? I’ve read a bit about a “Bulk Import” tool, but our management is very leery of any solution that is not out of the box as they are wanting to avoid as much customization as possible. I know this thread is a bit old at this point, but I do have a question about this capability. It seems that if you are using a calculated field in the sharepoint list to derive a number, you can’t assign the value to a custom field of type “number” in Project Online. It only displays text fields as mapping choices for calculated fields in the sharepoint list. Do you know if this is expected behavior? I would assume it is. Sounds like more of a SharePoint issue though. I think there’s something in the code which governs which field type can be mapped to which Project Server field type. You can always just copy the data into a free entry column and run the import tool, I suppose. Thanks Andrew. That makes sense. What I chose to do was delete all the Sharepoint calculated fields, and create new fields with their corresponding data types. I let the InfoPath form do all the calculations via Submit Rules, and update the list fields on submit. The fields all now map perfectly to my Project Online Custom Fields. Too bad MS is eliminating InfoPath. I hope they come up with something equally useful. I have gotten a LOT of value out of it.